click the button below to schedule an appointment via my online booking system. if you prefer to talk to me before making an appointment i can be contacted via email or phone. please note i request a minimum of 24 hours notice for cancelled appointments. appointments cancelled with less than 24 hours notice will incur a fee of half the price of the missed service. 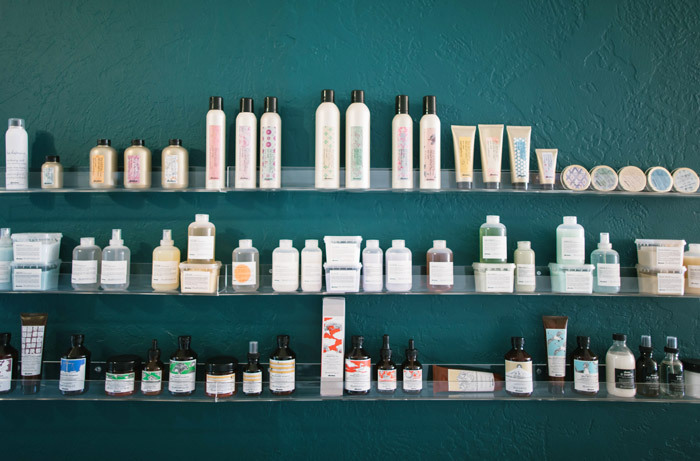 All the products I use in the salon are designed and produced by Davines, a family owned haircare company based in Parma, Italy. I strongly believe that their philosophy, which prioritizes quality, effectiveness and environmental responsibility, is unique in our industry. The result is beautiful, natural color that leaves your hair stronger and shinier than before, shampoos and conditioners that improve the health of hair and scalp, and styling products that unlock your hair's natural beauty. "As firm believers in curiosity, open mindedness and exploration, and with a high regard for culture in all its forms, we are constantly developing concepts and products that challenge the mainstream conceptions of beauty. Though we are an international company, our roots are planted in our heritage as a family-owned lab, guided by the desire for quality products with timeless appeal." So much of who we are and who we want to be is communicated through our appearance. My favorite client is someone who is excited to have fun collaborating on their self expression. My specialities are creating beautiful, natural color, and cutting difficult textures. I take pride in my long lasting, effortless looking results. Coaching my clients on how to recreate salon styles at home, as well as proper daily haircare is a big part of how I approach my daily work. I know that visiting the salon can be an intimidating experience for many of us, and I take the trust my clients put in me very seriously. I work hard to create an experience that is comfortable and fun for us both. I believe that what sets me apart as a stylist is understanding that each client is unique and that one style does not fit all; a compassionate evaluation of my clients' desires and needs helps us to find a balance between your lifestyle and natural hair texture, for a style that makes you feel like your best self. I enjoy chatting about books, cats and chickens, the latest in superhero movies and costume dramas, strategies for dismantling the patriarchy, as well as quietly listening to music together. I am looking forward to working with you on creating a new look that expresses who you are and complements your life style! I offer complementary consultations for those who want to meet and discuss your needs prior to booking an appointment. If you are ready to dive in and book a cut or color appointment, time for consultation is already built into your appointment. Pictures are always a helpful jumping off point for consultations, however they are not required. I strongly encourage my clients to bring in images of looks they like, REGARDLESS of wether or not you think it is possible and/or practical. I want to get to know you and your style as quickly as possible, and knowing what you find beautiful helps me to design a look that is perfect for, and unique to you. Libby did a fantastic job with my cut and toner. She really took the time to my wants and needs and get a sense of how much time and effort I’m willing to commit to my hair (not much ha). She has also been an educator and actually turned my visit into a lesson, which was awesome! The techniques she showed me have already made my routine more efficient and more effective. I actually have that salon fresh look every day now. Thanks, Libby! — Katherine L.
Best hair experience I have ever had…Libby is a pro on all levels! I was referred to Libby by a friend when experiencing a lot of trauma around extreme hair thinning. I walked out of my initial consultation with Libby with hope, some amazing products that literally started working immediately and a feeling of being in the hands of a talented and caring professional. When I returned for my appointment Libby gave me a great haircut that hid my thin spots, a treatment, and lots of education. Libby is the hair whisperer. I'm super grateful for her wisdom & talent! — Laurel T.
Libby is a consummate professional — I'm very picky about hair stylists (have tried many) and she is the best I've ever experienced. She is especially knowledge about styling curly and wavy hair and works magic. I really appreciate that she consults with you to discover your needs and provides useful tips for home styling. Not only highly skilled at her craft, she is also a pleasure to visit with. I've never been happier with my hair or a stylist. — L.V.